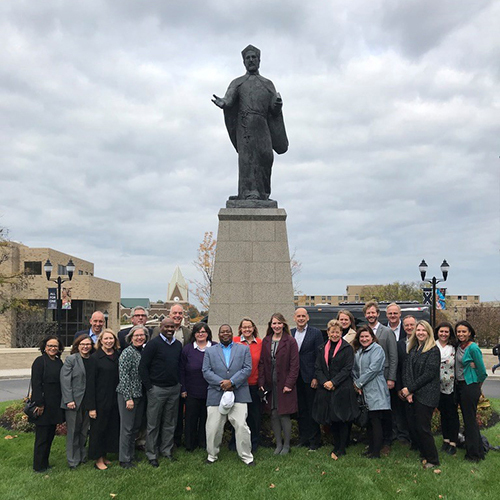 The AJCU Career Service Leaders are an affinity group within the AJCU network of 28 Jesuit colleges and universities in the United States (click here to access a list of members). The group sponsors the Jesuit Career Center Consortium, a partnership of Jesuit university and college Career Centers through which students and recent alumni can receive a uniform set of services and assistance with internship and job searches from the Career Centers for all students and recent alums at the 28 Jesuit colleges and universities nationally. These AJCU institutions provide the following career services (click here to download PDF). By indicating the services they provide, they are determining which services they expect other institutions to provide to their students and/or alumni. For the purposes of this service, students are considered an alum on their graduation dates. Resume critiques can be provided by all institutions remotely via telephone; therefore, this service is not available through the AJCU network. Some institutions are open to providing free or fee-based career coaching and counseling. For more information on the AJCU Career Service Leaders, please contact Jim Dickinson of Loyola University Maryland: jdickinson@loyola.edu, (410) 617-2334.